The Challenge is open to both experts and non-experts. Online applications will be open until 30 June 2016, and the winners will be announced sometime between September to October, 2016. Winners can receive grants of up to AU$750,000 (~US$550,000) for any single idea. The rising demand for fish, combined with unsustainable fishing practices, has put tremendous pressure on wild catches. Aquaculture — cultivation of fish and shellfish — has been trying to fill this gap. In fact, aquaculture’s contribution to the total food fish supply has increased from 9 percent in 1980 to 48 percent in 2011, according to UN’s Food and Agriculture Organization (FAO). Yet, like many other rapidly growing industries, aquaculture has numerous problems to overcome. Scientists say that many of the aquaculture industry’s practices are still environmentally and economically unsustainable. But now you can be part of the solution. The Blue Economy Challenge is open for online applications from 29 February 2016 to 30 June 2016. Photo courtesy of WWF. Both experts and non-experts can send in their ideas. “We have launched a challenge – hopefully the first in a series of Grand Challenges for Conservation – to harness the existing conservation and aquaculture experts, but also incorporate technologists, engineers, molecular biologists, designers, makers, innovators, hackers, marketers, financiers, behavioral biologists, economists, and anthropologists,” Alex Dehgan, co-founder of the Washington D.C.-based startup Conservation X Labs, and a senior visiting fellow at Duke University, told Mongabay. The Challenge will be open for online applications from 29 February 2016 to 30 June 2016, and the winners will be announced by the DFAT sometime between September to October, 2016. Winners can receive grants of up to AU$750,000 (~US$550,000) for any single idea. Mongabay spoke with Dehgan about the challenge. 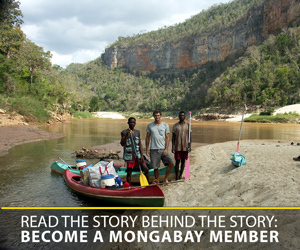 Mongabay: What prompted you to launch the challenge? Alex Dehgan: Global demand for protein is anticipated to skyrocket in the coming decades driven by two factors. First is population growth. We expect the planet to hold 9.6 billion people by 2050, which will require 70% more food, and a doubling of inputs. Second, humanity’s success in lifting billions from poverty into middle class will put out more demands for protein. Producing such food, without a massive increase of productivity per plant while simultaneously decreasing its environmental footprint, will require an increase in agricultural area equal to that of the United States, or another way to look at it, clearance of the Congo Basin and the Amazon Basin for agriculture. Our oceans and in particular aquaculture have the potential to produce a significant proportion of the world’s nutrition. The current aquaculture industry supplies 58% of the fish we eat in the global fish market. However, aquaculture (particularly predatory fish and prawn) is both economically and environmentally unsustainable, degrading both land and marine habitat, risking the introduction or spread of invasive species and pathogens, and polluting surrounding ecosystems. We also feed wild caught fish to farmed fish through fish meal (which is also used in other parts of agriculture), we need to rethink the design of our aquaculture systems (aquaculture in cities? ), and we need to harvest new products from the oceans. The Blue Economy Challenge­ is seeking entries that can help achieve both food security and conservation of oceans. Photo by Alex Dehgan. Aquaculture can be the protein source of the future, yet as the industry currently stands, it is in need of innovations to improve efficiency, sustainability, and long-term viability. Given that the challenges of population growth, food security, climate change, environmental degradation are growing exponentially, we need to ensure that our solutions can match the speed and scale of the challenges we face. To do so, we need to harness new sciences, new technologies, and new solvers to bear on this problem. For this reason, we have launched a challenge. If we have the ability to place a Volkswagen-sized rover on the surface of Mars, we have the ability to address the underlying drivers of extinction. We have been grateful to partner with the InnovationXchange of the Australian Department of Foreign Affairs and Trade (DFAT), who have been leaders in taking on new approaches to solving wicked problems. In addition to DFAT, we benefit from the intellectual leadership of the conservation organization WWF, and innovation firms, Second Muse, and 9 Sigma. Mongabay: Why is the challenge focused on the Indian Ocean region? Alex Dehgan: Most of the innovations in aquaculture have been created for developed countries, but that isn’t where aquaculture happens. Ninety percent of aquaculture occurs in the developing world where the lack of access to current technologies and capital, coupled with weak regulation, are barriers to change. People in a number of developing countries in the Indian Ocean Region rely on fish for over half of the animal protein in their diets (i.e. Bangladesh, Comoros, Indonesia, Maldives, and Sri Lanka), and this will likely increase with growing populations. Mongabay: Do you the field of conservation science needs more innovation? Alex Dehgan: Yes. The field of conservation science, which coalesced as a discipline and an academic society in the last three decades, faces serious challenges. The existing set of conservation tools are increasingly insufficient to match the speed at which the changes are occurring. Moreover, conservation practice has been at times technophobic, pessimistic, backwards looking, un-innovative, and incremental in the face of the exponential increases in the problem, but this is starting to change. Conservation can no longer merely catalogue the demise of the species on this planet. Rather, it must shift from being a descriptive, discovery-based science to a transdisciplinary field that seeks to engineer solutions. Just as we are driving extinction, we have the power to reverse it. We can apply our innovation capacity and harness exponential technological advances to engineer resilience to global environmental changes, change demand and incentive structures to alter our behavior, and improve our ability to monitor and protect species around the world. Humanity has caused these problems, but we have the ability to solve them. 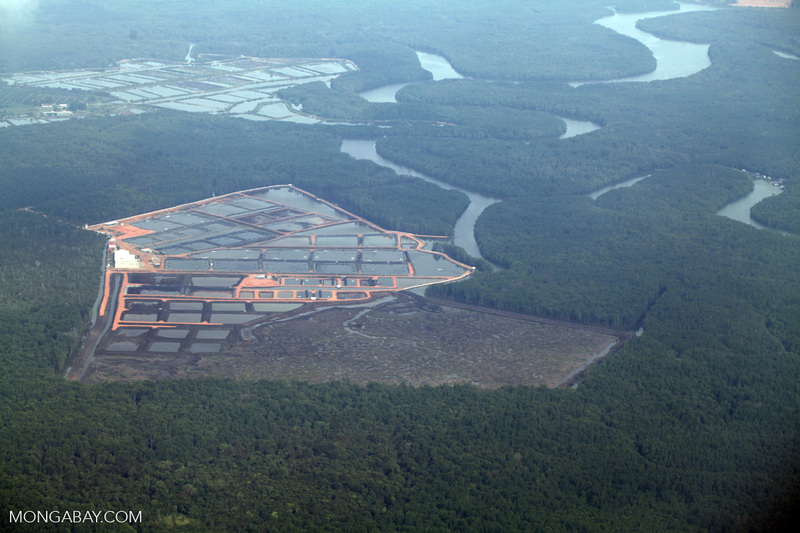 Mangrove clearing for shrimp farming Malaysia. Photo by Rhett Butler. The democratization of science and technology has given us powerful new tools to apply to conservation challenges. Technology has gained exponentially in processing power, memory capacity, number of sensors, pixel capacity, connectivity, and storage. Current advances in molecular biology are rivaling—and in some cases overtaking—the rate of change that we have seen in computing and information technology. We have the ability to fight diseases that are driving species extinct, development replacement products (such as for feed), provide substitutes for resources that are the underlying drivers of environmental degradation—from protein to plastics— or change demand for products that are behind the Sixth extinction (e.g., ivory, shark fin, rhino horn). Advances in robotics, machine learning & vision, drones, and nanosatellites has given us the ability to scale our ability to detect change to a continental scale in near real time. The explosion in particular of the power, capacity, and connectivity of mobile platforms in both the developing and the developed world has created citizen sensors. In fact, open source approaches can help develop and/or source new ideas or products, distribute the burden for collecting and analyzing data, co-design new solutions, and share in the burdens of research, publication, and funding, while simultaneously engaging the public. Ultimately, it is about conservation harnessing, building, and mobilizing a ‘tribe’ of conservation visionaries, solvers, and doers that will bring a new wave of innovation to the field. 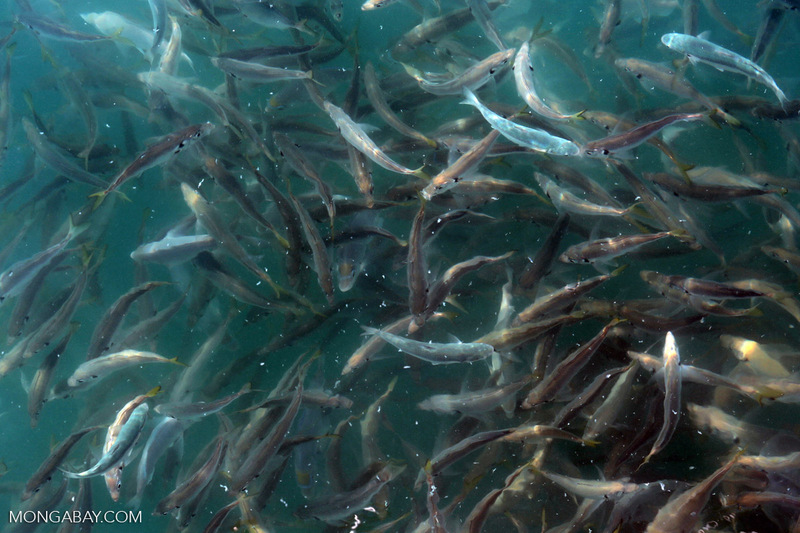 Mongabay: You’re seeking ideas that can address three main problems in aquaculture. Could you give us an example(s) of a recent innovation that you think addresses any of these problems. Alex Dehgan: While we can, we don’t want to presuppose what the final solution looks like. So instead, we will tell you what we are really excited about and how we are thinking about the problem. First, we are challenging people to develop feed replacements that match or improve on the nutrition of fish meal, at the same or lower cost, and do not contain wild caught fish, or create secondary environmental or development problems. New developments in synthetic biology look promising as well as generating feed from soy, seaweed, biofuel/ethanol byproducts, algae, yeast, bacteria, and insects. Second, there is great potential for innovation in the development of new ocean products, as the vast majority of aquaculture farms produce only a few products such as shrimp and certain finfish. While aquaculture focuses primarily on fish, harvesting seaweed or other fast growing ocean plant/algae may have significant potential for providing sustainable food supplies, particularly in integrated productive systems. The challenge isn’t just in what you grow, but how to you bring it to market and see it adopted. Palatability and consumer adoption will be part of the challenge for innovators. Such products may even address other ocean challenges, such as ocean acidification or excess nitrogen in the water. The challenging is seeking ideas to develop feed replacements that match or improve on the nutrition of fish meal, at the same or lower cost, and do not contain wild caught fish, or create secondary environmental or development problems. Photo by Rhett Butler. Third, improvements in design can rethink both where we grow fish, as well as how we grow them. This can include novel places for aquaculture outside of coastal regions, from the open ocean, to within land. We need to think about aquaculture as a system, that allows for waste to be reused and increases the efficiency of the whole system. 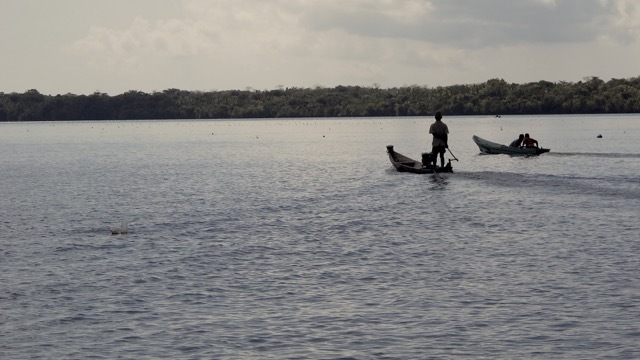 Aquaculture can rebuild natural capital, rather than destroy it. While there are some impressive high-end aquaculture facilities in existence in developed countries where the water is purified and recirculated, waste is reused as inputs, fish are fed fish-free diets, and new products are developed for consumption, we need to design these systems for the developing world. This may suggest innovations not only in technology, but even in business models. Mongabay: What sorts of ideas are you not looking for? Alex Dehgan: First, we are looking for transformative solutions, the revolutionary over evolutionary ideas. We are not looking for incremental improvements. 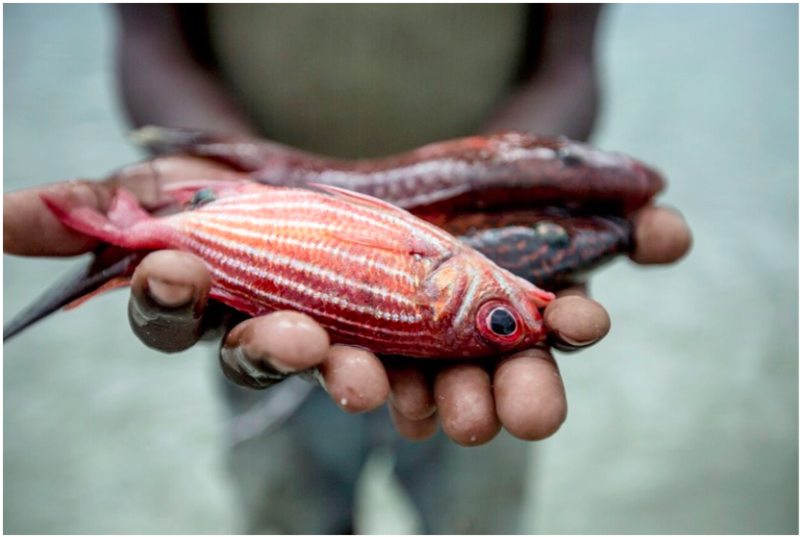 These are ideas that fundamentally rethink aquaculture in developing countries around the three areas of the challenge, that may borrow from adjacent spaces (i.e. biofuels), or that allow us to redesign entire systems. Second, we want people to be able to apply these ideas within the developing world where 90% of aquaculture happens. This means applying design principles to aquaculture, and thinking beyond the product to the distribution channels, considering the environments and contexts where these solutions will be implemented, as well as price points, cultural practices, supply chains, sustainability, and scalability. Third, we are looking for ideas that can have both environmental and development impacts. This is the idea behind the concept of the blue revolution – how do we create new pathways for food security and conservation of the oceans? Finally, we want to try these ideas out as soon as possible. So they can’t just be dreams, but we want to see prototypes that can be tested, improved, and turned into enterprises that can scale. Mongabay: Is there anything else that you would like to add? Alex Dehgan: We are also encouraging participatory storytelling. If you check the hashtag #BlueRevolution you will see videos from citizens, conservation activists and innovators sharing their ideas around rethinking aquaculture. In terms of challenges and prizes, here is what is special – the best ideas do not have to come from the sector. We are looking for the unexpected, and for individuals to share this as broadly as possible to get at the best solutions.